Our 9-month-old still has no teeth so teething rings are top of mind here at Bondville. Check out these super-cute rattle + teething ring + soft toy DingaRings that I found at the Sunshine Coast recently. Designed in Byron Bay by Kate Nicolson and Leesa Hallahan from O.B. Designs, these rings include a cast of characters full of personality, including Aussie-themed Tony Tree Frog, Gi Gi Galah, Craig Crocodile and Keith Koala. 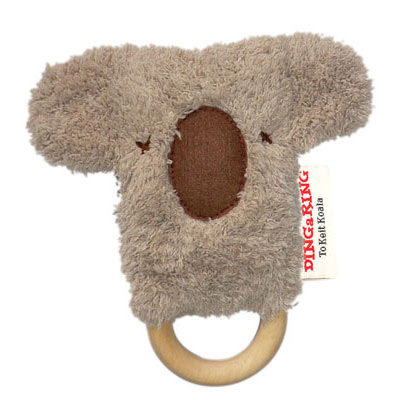 The range includes both muted tones and bright colours, soft bodies and wooden rings to soothe those sore gums. These teething rings would make excellent newborn gifts or a present for a baby shower, particularly for friends and family overseas. O.B. Designs is an environmentally-conscious business using recyclable point of sale and office materials. You can find DingaRings in the online store as well as at stockists across Australia, the UK, UAE, Belgium and the Netherlands. these are too cute and super unique!